Welcome to The Abso!ute Sound online! We explore music and the reproduction of music in the home. We believe that the sound of music, unamplified, occurring in a real space is a philosophic absolute against which we may judge the performance of devices designed to reproduce music. Our goal is to provide the resources consumers need to judge how a component's sound either honors or departs from the music's truth, and to make sound purchasing decisions that maximize their experience of reproduced sound. Below is our Issue 220, February 2012 table of contents and link to the editorial. 12 Dealer Profile: We visit Hanson Audio Video in Dayton, Ohio. 24 Pages of the hottest new gear coming your way. DR. CHARLES ZEILIG AND JAY CLAWSON CONTINUE THEIR GROUNDBREAKING ATTEMPT TO EVALUATE AND QUANTIFY EVERY SONIC VARIABLE IN COMPUTER AUDIO. PART THREE OF THIS FOUR-PART SERIES EXPLORES WHETHER FLAC IS REALLY SONICALLY TRANSPARENT. 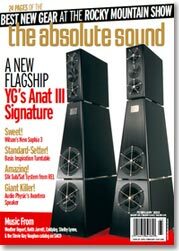 Neil Gader reports on a diminutive three-piece package that delivers outsized performance. Robert Harley lives with the turntable "inspired" by Basis' own $170,000 Work of Art 'table. The spectacular bargain that was the Alpha DAC is now even more spectacular, courtesy of significantly upgraded sonics — and no price increase. Robert Harley brings you the good news. Who says great amplification has to cost a small fortune? Paul Seydor discovers one of the true bargains in high-end integrated amps. 90 BSG Technologies QOL "Signal Completion Stage"
Robert Harley investigates a new technology that reportedly solves a fundamental problem in reproduced music. PLUS: QOL inventor Barry Stephen Goldfarb interviewed. JV on a beautifully engineered floorstanding speaker from Audio Physic of Germany that competes nearly toe-to-toe with the biggest of the Big Boys for roughly one-third the price. The AC power-conditioning leader has created reference-grade interconnects and cables, says Robert Harley. Wilson's most affordable floorstanding speaker is now even better than ever. Neil Gader reports. THIS AMBITIOUS LOUDSPEAKER WITH DRIVER CONES MACHINED FROM SOLID ALUMIMUM BILLET HITS ALL THE RIGHT BUTTONS. PLUS! INSIDE THE YG FACTORY: A PHOTO ESSAY. Round-Up: Alan Taffel and Andrew Quint review recent hi-res downloads — rock, classical, and jazz. 130 Rock: New releases from Chris Isaak, Coldplay, Shelby Lynne, Moreland & Arbuckle, and Tom Waits; stellar reissues of Stevie Ray Vaughan and the Grateful Dead; and vintage recordings of teenage Hank Williams. 136 Classical: Choral music by Anonymous 4 and Conspirare, concertos by Widor, trios by Bernstein and Shostakovich, piano works by Earl Wild, and showpieces by the Chicago Symphony Brass. 140 Jazz: The latest Keith Jarrett, Jeff Gauthier, and Rudresh Mahanthappa, along with notable reissues of Weather Report and Julius Hemphill. 138 Fives Faves: Greg Cahill selects his personal favorites by interplanetary master Sun Ra. 144 Back Page: TAS talks with John McDonald, President of Audience.